All motor vehicles imported into Australia must comply with the standards set down by the Federal Office of Road Safety (FORS). In 2004 these Design Rules were again updated to include all the present standards which must be met by each imported vehicle prior to registration and use on Australian roads. The new legislation arrangements included the introduction of a Specialist & Enthusiast Vehicle Scheme (SEVS) to determine the eligibility of vehicles for importation and replaced the (bulk) old type approvals under the Australian Design Rules (ADR) with a vehicle by vehicle compliance approval by Registered Automotive Workshops. This new legislation now requires each type of vehicle to be crash tested (all imported vehicles less than 15 years old) to meet the new requirements. Under the new scheme only RAWS approved workshops will be able to comply vehicles to the Australian Design Rules and only RV8 Cars Australia are approved under the new legislation to Comply RV8’s to these standards in Australia. 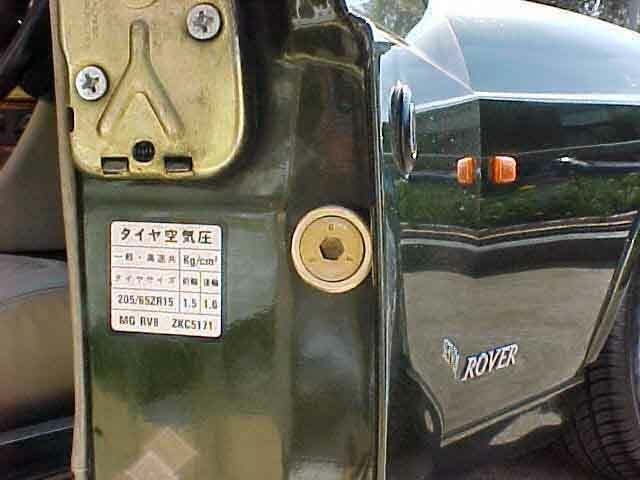 The modifications required on Australian Imported RV8's are : Seatbelts: (new approved seatbelts must be fitted) Mirrors: (concave lenses removed and replaced with true imaging flat ones) Speedo: (fit a new 6 barrel odometer to show correct kilometres travelled or have the old speedo altered to include a six barrel odometer. 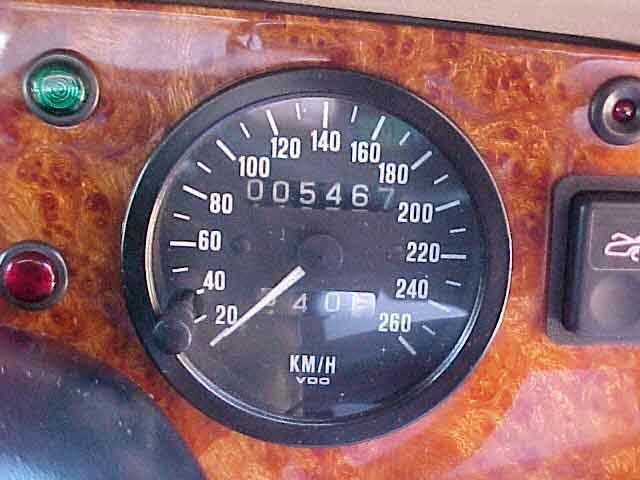 All speedo alterations must show original kilometres travelled). Catalytic Converters: (new converters must be fitted). Tyres: (new tyres must be fitted). Badging: (all appropriate information ie. tyre pressures etc must be in English). 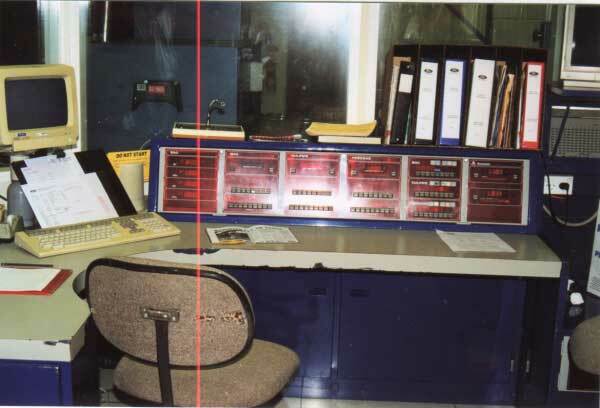 Electrical wiring: (dashboard, instrument light control dimmer switch, wipers variable speed and radio retuned to accept Australian stations etc.) Intrusion Bars: (must be fitted to both doors). 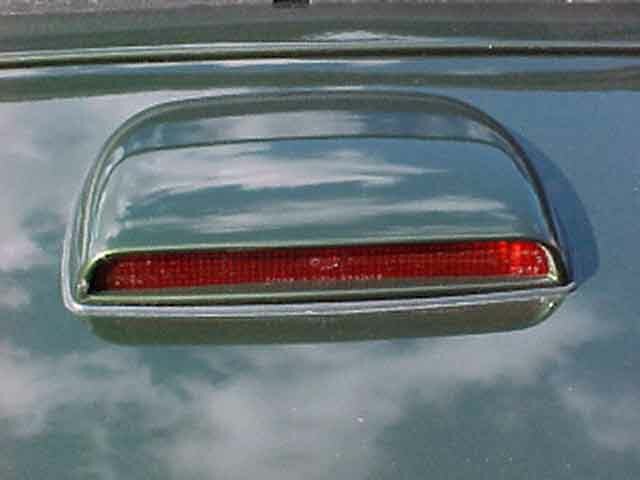 High Rise Stop Light: (must be fitted, which is mounted on the RV8 boot lid). Owners Handbook: (in English). Numerous other small items have also to be attended to. Early methods of fitting intrusion bars to Australian RV8 Doors. ( See Allen Head Bolts in Picture ). Steel Intrusion Rod is passed through the door. 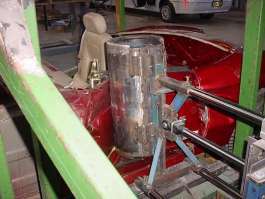 ( See special shaped nut locking rod into place ). Following the introduction of the new RAWS Scheme (effective from May 2003) the most significant change/upgrade was Australian Design Rule 29 (ADR29) concerning Side Impact Intrusion Bars. The Newly designed intrusion bar worked well and was able to pass the test. The following pictures show an RV8 undergoing Side Intrusion Bar Testing. people do not realise it has been added. Once these modifications have been completed the vehicle is then inspected by a Certified and Registered Professional Engineer who will upon passing the vehicle issue a signed certificate, certifying the vehicle now complies with all the Australian Design Rules. The Engineers Certificate is then sent to FORS & the Department of Transport & Regional Development. 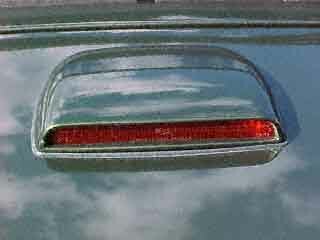 Upon receipt a Green Compliance Plate is issued bearing the vehicles approval number and all other relevant information. 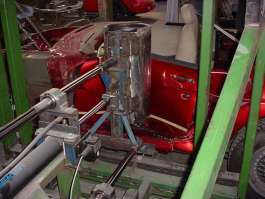 The plate is then affixed in the engine bay. The vehicle is now ready for the Road Traffic Authority (RTA) to inspect prior to registration. This inspection is carried out at an RTA Inspection Station or at a special Vehicle Registration Inspection Station authorised to issue Blue Slips. 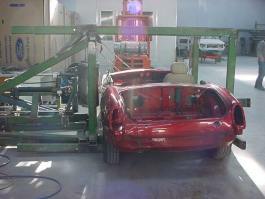 This inspection is extensive even requiring the vehicle to be weighed. 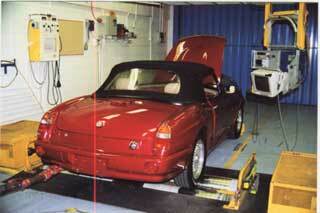 Upon receipt of the Blue Slip the car is now certified fit for registration on public roads. The RTA will then processes all the paperwork comparing it with their records for each particular type of vehicle. Finally should everything prove satisfactory the owner is then requested to make the appropriate payment. (in my case $2638 covering Registration, Stamp Duty and Number Plate purchase). Comprehensive Vehicle Insurance and Green Slip 3rd Party Insurance was an additional $1060 & $404 respectively. 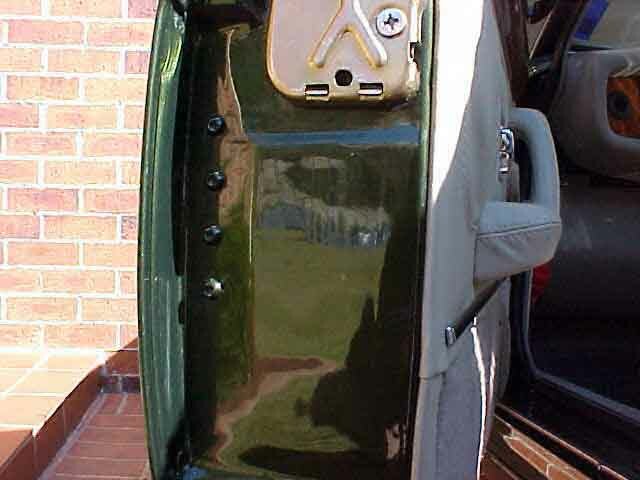 Through my website I have compiled for the MG Car Club a list of 226 MGRV8's which have been Imported into Australia. (All are Ex-Japanese Cars). The vast majority of these vehicles have been imported by RV8 Cars in New South Wales. RV8 Cars are fully authorised to carry out the necessary modifications for registration on Australian roads. RV8 CARS were the first Australian Importers, as such they had to meet and satisfy all the legal requirements concerning the Low Volume Imports Scheme which covers the importing of all second hand vehicles into Australia. All Low Volume Imports are governed by the Department of Transport & Regional Services (DOTARS) a Federal Government Department. 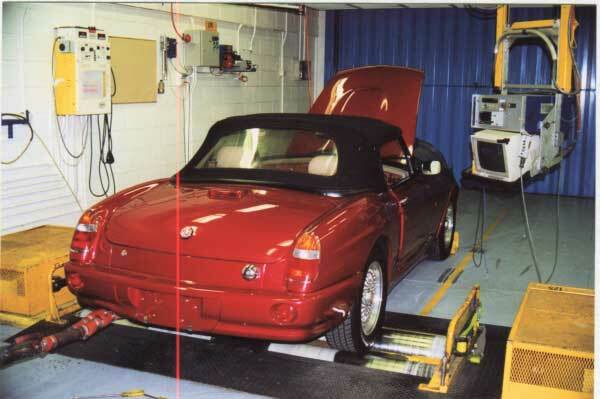 Under this department is (RAWS) the Registered Automotive Workshop Scheme section, who inturn control and administer the Low Volume Imports Scheme of Specialist & Enthusiast Vehicles. The initial testing of the RV8 was extensive and involved specialised equipment. 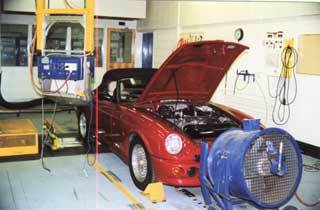 The Ford Motor Company of Australia had the necessary equipment and the tests were carried out by them. The RV8 performed well and passed without any problems. Pictures curtesy of Stuart Radcliff (owner & operator) of RV8 Cars Australia. NB. RV8 Cars also provide a Compliance Service for private imports.